A prominent phenotype of IRF8 knockout (KO) mice is the uncontrolled expansion of immature myeloid cells. The molecular mechanism underlying this myeloproliferative syndrome is still elusive. In this study, we observed that Bax expression level is low in bone marrow preginitor cells and increases dramatically in primary myeloid cells in wt mice. In contrast, Bax expression level remained at a low level in primarymyeloid cells in IRF8 KO mice. However, in vitro IRF8 KO bone marrow-differentiated myeloid cells expressed Bax at a level as high as that in wild type myeloid cells. Furthermore, we demonstrated that IRF8 specifically binds to the Bax promoter region in primary myeloid cells. Functional analysis indicated that IRF8 deficiency results in increased resistance of the primary myeloid cells to Fas-mediated apoptosis. Our findings show that IRF8 directly regulates Bax transcription in vivo, but not in vitro during myeloid cell lineage differentiation. All types of immune cells are derived from the hematopoietic stem cells in the bone marrow (BM) through a hierarchical differentiation process. This differentiation process is tightly regulated by lineage-specific transcription factors (1). IFN regulatory factor 8 (IRF8/ICSBP) is a key transcription factor that regulates myeloid cell and B cell differentiation under physiologic conditions (2–4). IRF8 knockout (KO) mice and mice with a mutation in the IRF8/ICSBP gene develop a myeloproliferative syndrome with uncontrolled clonal expansion of undifferentiated myeloid cells (2, 5). The molecular mechanisms underlying myeloproliferative syndrome in IRF8-deficient mice is still elusive. Previous studies have identified multiple apoptosis-related genes, including FAP-1, FLIP, Bcl-xL, Bcl-2, that are regulated by IRF8 in myeloid cell lines in vitro (6–12). These prominent studies suggest that the myeloproliferative syndrome of IRF8-deficient mice might be the result of altered sensitivity of myeloid cells to apoptosis in vitro; however, these studies also suggest that regulation of apoptosis-related genes by IRF8 is dependent on cell type. Furthermore, it has been shown that regulation of Bcl-2 by IRF8 observed in vitro might not be observed in vivo (10). In this study, we compared the genome-wide gene expression profiles of CD11b+ primary myeloid cells purified from wild type (wt) and IRF8 KO mice and identified that Bax is an IRF8 target gene in vivo but not in vitro. Our data suggest that IRF8 directly binds to the Bax promoter region to activate Bax transcription and that the loss of IRF8 expression significantly decreases primary myeloid cell sensitivity to Fas-mediated apoptosis. Thus, our results suggest that IRF8 mediates myeloid cell differentiation partially through regulating Bax expression and the Fas-mediated apoptosis pathway in vivo. IRF8 KO mice (provided by Dr. Keiko Ozato, National Institutes of Health, Bethesda, MD) were maintained as described (5). All IRF8 KO mice used for the study were between the ages of 43 and 60 d. To generate chimeric mice, wt C57BL/6 recipient mice were irradiated with a dose of 950 rad. BM cells from IRF8 KO and age-matched littermate wt mice (5 × 106 cells per mouse) were injected 4 h later to the irradiated mice. Mice were used 30 d after BM transplantation. All mice were studied in accordance with approved Georgia Health Sciences University protocols. CD11b+ cells were isolated from spleen cells using anti-CD11b mAb (Biolegend) and magnetic beads. DNA microarray analysis of genome-wide gene expression with mouse OneArray (Phalanx Biotech, Belmont, CA) was performed as previously (13). RT-PCR analysis was performed as previously (14). The PCR primer sequences are as follows: mouse Bax, forward: 5′-GGATGCGTCCACCAAGAAGC-3′; reverse: 5′-GGAGGAAGTCCAGTGTCCAGCC-3′. Quantitative PCR reactions were performed in a StepOnePlus Real-Time PCR System (Applied Biosystems, Carlsbad, CA). CD11b+, CD4+, CD8+, and NK+ cells were isolated from minced spleens with the respective mAb (Biolegend, San Diego, CA) and magnetic beads. Western blot analysis was performed as previously (15). The blots were probed with the following Abs: anti-Cytochrome C (BD Biosciences, San Diego, CA) at 1:500, anti-Bax (Santa Cruz Biotech, Santa Cruz, CA) at 1:2000, anti-cleaved poly(ADP-ribose) polymerase (PARP) (Cell Signal, Danvers, MA) at 1:500, and anti–β-actin (Sigma, St Louis, MO) at 1:8000. Blots were detected using the ECL Plus (Amersham Pharmacia Biotech, Piscataway, NJ) Western detection kit. Spleens were minced to make single-cell suspension through a cell strainer (BD Biosciences). The cell suspension was stained with FITC-conjugated anti-mouse CD11b mAb (BD Biosciences). The stained cells were analyzed by flow cytometry as previously (16). Cytosol and mitochondrion-enriched fractions were prepared as described previously (17). CD11b+ cells were purified by depleting other subsets of cells with respective mAbs and magnetic beads. Chromatin immunoprecipitation (ChIP) assays were performed according to protocols from Upstate Biotech (Lake Placid, NY) as previously (13). Immunoprecipitation was performed using anti-IRF8 Ab (C-19; Santa Cruz) and agarose-protein A beads. The PCR primers used to amplify the promoter region of the Bax gene as depicted in Fig. 3A are as follows. ChIP 1, forward: 5′-GGGAAGGGCAGGTTTTAGAG-3′, reverse: 5′-TGCCTAGGGAATGGAGTCAC-3′; ChIP2, forward: 5′- TGGGTGCTTTCAGAGCTTTT-3′, reverse: 5′- TTTAATCCCAGCCCTCAGAA-3′; ChIP 3, forward: 5′- TATCCAGGTTTGCCTCGAAC-3′, reverse: 5′- GATGCCCAGAGTTGGTTGTT-3′; ChIP4, forward: 5′- TGTCTCCCCTCAGGGTTATG-3′, reverse: 5′- TGCAGCTCCATATTGCTGTC-3′. EMSA was performed as previously (18). The DNA probes are as follows: GAS wt probe, forward: 5′- ACCTTCGGAAGAACAG-3′, reverse: 5′- CTGTTCTTCCGAAGGT-3′; GAS mutant probe, forward: 5′- ACCTAGGGAACTACAG-3′, reverse: 5′- CTGTAGTTCCCTAGGT-3. Oligonucleotides were annealed and end-labeled with γ-[32P]-ATP and used for EMSA as previously (18). Total spleen cells were cultured in the absence or presence of Fas ligand (FasL) (10 ng/ml) overnight. The cells were then collected and stained with anti-CD11b mAb and Alex Fluor 647-conjugated annexin V. The CD11b+ cells were gated out to determine the percentage of annexin V+ CD11b+ cells. The percentage of cell death was calculated by the following formula: % cell death = % annexin V+ cells with FasL treatment − % annexin V+ cells without FasL treatment. As noted before, the size of the spleen from IRF8 KO mice was significantly larger than that from wt mice (Fig. 1A). The number of Gr1+ and CD11b+ cells that likely include macrophages and granulocytes are dramatically increased in the spleen of the IRF8 KO mice and accounts for >50% of the total spleen cells (Fig. 1B), thus validating the function of IRF8 as a key transcription factor in lineage-specific differentiation of myeloid cells (5, 19). Identification of Bax as an IRF8 target gene in primary myeloid cells. A, Spleens of wt (left) and IRF8 KO (right) mice. B, A single-cell suspension was prepared from the spleens of IRF8 KO and age-matched wt littermate control mice and was analyzed for subsets of immune cells as indicated. The number in the box indicates the percentage of that subset of cells. Shown are representative data from one of three pairs of mice. C, Differential Bax gene expression between wt and IRF8 KO primary CD11b+ myeloid cells. Data were derived from DNA microarray analysis. The expression of Bax in wt CD11b+ myeloid cells was set as 1. DNA microarray analysis of purified CD11b+ cells from IRF8 KO mice and age-matched littermate control wt mice revealed that among the 26,423 transcript probes analyzed, the expression levels of 1047 genes changed at least 1.6-fold (Gene Expression Omnibus accession no. GSE31464, http://www.ncbi.nlm.nih.gov/geo/query/acc.cgi?acc=GSE31464). Gene ontology biologic process-based classification (http://www.pantherdb.org/genes/batchIdSearch.jsp) identified 42 genes (Supplemental Table I), including Bax (Fig. 1C), with known function in apoptosis. 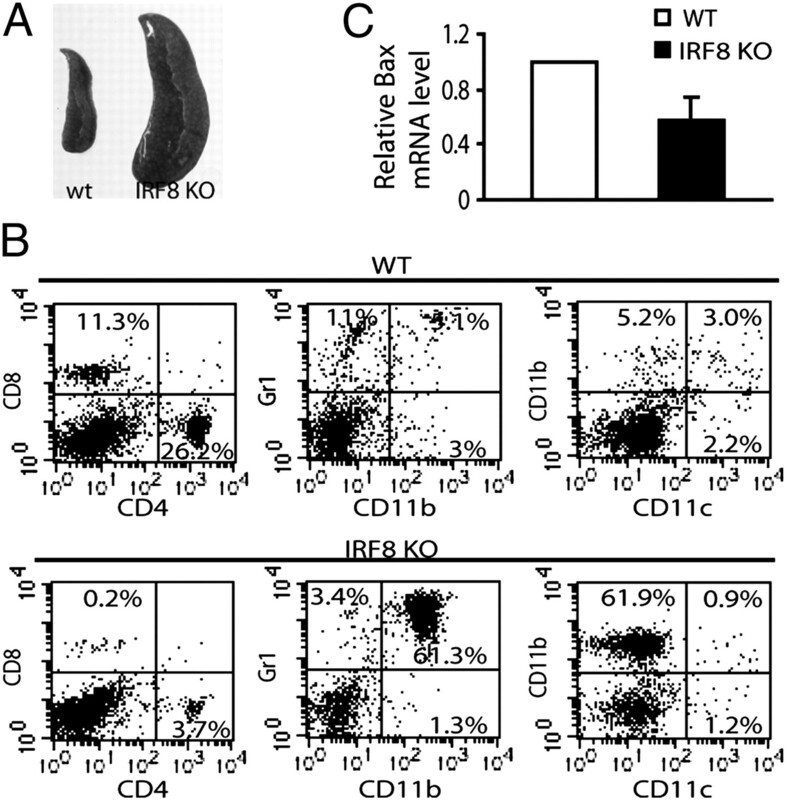 Western blotting analysis revealed that Bax protein level is also dramatically lower in IRF8 KO CD11b+ primary cells than in wt CD11b+ primary cells (Fig. 2A). However, Bax protein level is not significantly different in CD4+CD8+ and NK cells between the IRF8 KO and wt control mice (Fig. 2A). Quantitative RT-PCR analysis indicates that the Bax mRNA level is significantly lower in IRF8 KO CD11b+ primary cells than in the CD11b+ primary cells of age-matched wt littermate control mice (Fig. 2A). The Bax protein level is low in BM cells of both wt and IRF8 KO mice (Fig. 2A). IRF8 regulates Bax expression in myeloid cells in vivo. A, Western blot analysis of Bax protein levels in subsets of immune cells (top panel) and BM (bottom right panel) cells. The indicated subsets of immune cells were isolated from the spleens of IRF8 KO and age-matched littermate wt control mice and analyzed by Western blot analysis. Total RNA was also isolated from CD11b+ cells of the spleens of wt (n = 4) and IRF8 KO (n = 5) mice and analyzed for Bax mRNA level by real-time PCR (bottom right panel). B, Image showing the sizes of spleens from chimera mice with wt and IRF8 KO BM. C, Subsets of immune cells of spleens from chimera mice (top left panel) and in vitro-differentiated macrophage (top right panel) were analyzed as in Fig. 1B. CD11b+ cells purified from spleens of wt and IRF8 KO chimera mice (bottom left panel) and in vitro BM-differentiated macrophage cells (bottom right panel) were then analyzed for Bax protein level by Western blott analysis. D, Quantification of Bax protein level as shown above. The levels of Bax protein in the respective wt cells were set as 1. Column, mean; error bar, SD. Lethally irradiated wt mice that received BM from IRF8 KO mice also exhibited splenomegaly (Fig. 2B). These IRF8 KO chimera mice showed immune cell profiles (Fig. 2C) similar to the conventional IRF8 KO mice (Fig. 1B). The Bax protein level of these IRF8 KO chimera mice is also dramatically lower than that in wt chimera mice (Fig. 2C). In vitro differentiation of BM cells from both wt and IRF8 KO mice with GM-CSF and M-CSF generated CD11b+ cells (Fig. 2C). However, Bax protein level of these in vitro-differentiated IRF8 KO CD11b+ cells is as high as that in wt CD11b+ cells (Fig. 2C, 2D). Our data suggest that IRF8 regulates Bax expression in vivo but not in vitro during myeloid cell differentiation (Fig. 2D). ChIP assays were performed with purified wt CD11b+ primary cells to determine whether IRF8 protein is associated with the Bax promoter. As illustrated in Fig. 3A, the Bax promoter region contains several IRF8 consensus binding elements (GAS and EIRE) (Fig. 3A) (20, 21). Specific IRF8 binding was detected in one region of the Bax promoter (Fig. 3B). EMSA with nuclear extracts from purified wt and IRF8 KO CD11b+ cells indicated that IRF8 directly interacts with one of the GAS elements in the Bax promoter region (GAS1; Fig. 3C). Initial attempts did not detect IRF8 binding to a DNA probe containing GAS2-4 (data not shown). Our data suggest that IRF8 directly binds to the Bax promoter in primary CD11b+ cells. IRF8 binds to the Bax promoter in primary myeloid cells. A, The mouse Bax promoter structure. The ChIP PCR regions are indicated at the top. The numbers indicate nucleotide locations relative to the Bax transcription initiation site. Locations of IRF8 binding consensus sequence elements (GAS and EIRE) are also indicated. B, ChIP analysis of IRF8 binding to the Bax promoter in purified primary myeloid cells. gDNA, genomic DNA positive control. C, IRF8 binding to the Bax promoter DNA elements in vitro. A GAS1-containing DNA was used as probe in the EMSA. The potential probe–IRF8 complexes are indicated at the right. The above observation that IRF8 KO myeloid cells exhibit decreased Bax expression leads us to speculate that the IRF8 KO cells might acquire resistance to apoptosis. To test this hypothesis, we first measured cytochrome C (CytC) release, a biochemical marker for the intrinsic apoptosis pathway, in purified primary CD11b+ cells. Spontaneous CytC release is higher in purified wt CD11b+ cells ex vivo as compared with IRF8 KO cells (Fig. 4A). Treatment with FasL induced a rapid increase in CytC release in wt CD11b+ cells, but not in IRF8 KO CD11b+ cells (Fig. 4A). Consistent with the CytoC release pattern, cleaved PARP, a biochemical marker of both extrinsic and intrinsic apoptosis, was also observed in wt but not in IRF8 KO CD11b+ primary cells (Fig. 4A). At the functional level, the wt CD11b+ primary cells exhibited significantly more spontaneous apoptosis ex vivo with FasL further increasing the apoptosis rate. 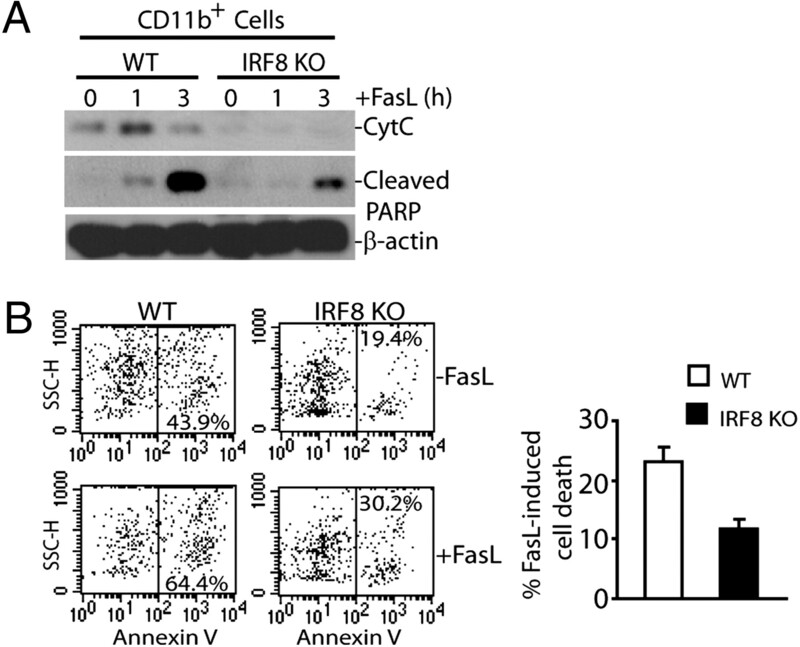 However, the IRF8 KO CD11b+ cells exhibited significantly less spontaneous apoptosis and became less sensitive to FasL-induced apoptosis ex vivo (Fig. 4B). Our data suggest that the loss of IRF8 function decreases CD11b+ primary cell sensitivity to Fas-mediated apoptosis. IRF8 KO primary myeloid cells exhibit increased resistance to Fas-mediated apoptosis. A, CD11b+ primary myeloid cells were isolated from the spleens of IRF8 KO and age-matched littermate control wt mice. The cells were treated with FasL in vitro (10 ng/ml) for the indicated time. Cytochrome C and cleaved PARP levels in the cytosol were analyzed by Western blot analysis. One representative result of two independent experiments is shown. B, IRF8 KO myeloid cells exhibit increased resistance to apoptosis than the wt myeloid cells. Single-cell suspension was prepared from spleens of IRF8 KO and age-matched littermate control mice. Cells were incubated with FasL (10 ng/ml) in vitro for ∼6 h. The cells were then stained with allophycocyanin-conjugated anti-CD11b mAb and Alex Flour 647-conjugated annexin V and analyzed by flow cytometry. CD11b+ cells were gated to determine the annexin V+ cells. Representative results of one of three independent experiments are shown. The bottom right panel shows quantification of FasL-induced apoptosis. The percent of FasL-induced cell death was calculated by the following formula: % annexin V+ cells in the presence of FasL − % annexin V+ cells in the absence of FasL. Column, mean; error bar, SD. IRF8 is essential for myeloid cell differentiation, and loss of IRF8 expression leads to uncontrolled clonal expansion of CD11b+ myeloid cells (5). It has been proposed that acquisition of apoptosis resistance is responsible for the impaired myeloid cell differentiation (6–12). Several apoptosis regulators, including Bcl-xL, Bcl-2, FAP-1, and acid ceramidase, have been shown to have a role in regulating apoptosis in myeloid leukemia cell lines in vitro (6–8, 16). IRF8 has also been shown to regulate FLIPL expression in primary myeloid cells in vivo (17). The function of IRF8 in apoptosis has also been demonstrated in other nonhematopoietic cells (17, 22–24). In addition, it has been shown that the correlation between IRF8 and the Bcl-2 family members observed in vitro may not be observed in vivo (10). Therefore, the function of IRF8 in the regulation of apoptosis-related genes might be cell type-dependent and different between in vitro and in vivo conditions. Our data indicate that IRF8 directly binds to the Bax promoter to regulate Bax transcription in primary myeloid cells in vivo but not in vitro. The Fas-mediated apoptosis pathway plays an essential role in the elimination of unwanted cells by the host immune system during lineage differentiation and homeostasis (25, 26). Bax is a key mediator of the mitochondrion-dependent intrinsic apoptosis pathway (27). Our data indicate that IRF8 is a transcription activator of Bax. Therefore, IRF8 might mediate myeloid homeostasis and differentiation through regulating Bax expression to maintain the myeloid cell sensitivity to Fas-mediated apoptosis. However, IRF8 also regulates the expression of other apoptosis-related genes in primary myeloid cells in vivo (Supplemental Figs. 1, 2). Therefore, the relative role of Bax and other IRF8-regulated and apoptosis-related genes in IRF8-mediated myeloid cell differentiation in vivo requires further study. We thank Dr. Jeanene Pihkala for assistance in flow cytometry analysis. This work was supported by National Institutes of Health Grant CA133085 (to K.L.) and American Cancer Society Grant RSG-09-209-01-TBG (to K.L.). The microarray data presented in this article have been submitted to the Gene Expression Omnibus (http://www.ncbi.nlm.nih.gov/geo/query/acc.cgi?acc=GSE31464) under accession number GSE31464.
. 2002. IFN consensus sequence binding protein/IFN regulatory factor-8 guides bone marrow progenitor cells toward the macrophage lineage. J. Immunol. 169: 1261–1269.
. 2008. The BXH2 mutation in IRF8 differentially impairs dendritic cell subset development in the mouse. Blood 111: 1942–1945.
. 2009. The interferon consensus sequence binding protein (ICSBP/IRF8) activates transcription of the FANCF gene during myeloid differentiation. J. Biol. Chem. 284: 33242–33254.
. 2011. IFN regulatory factor 8 restricts the size of the marginal zone and follicular B cell pools. J. Immunol. 186: 1458–1466.
. 1996. Immunodeficiency and chronic myelogenous leukemia-like syndrome in mice with a targeted mutation of the ICSBP gene. Cell 87: 307–317.
. 1999. Regulation of apoptosis in myeloid cells by interferon consensus sequence-binding protein. J. Exp. Med. 190: 411–421.
. 2008. The interferon consensus sequence-binding protein (ICSBP/IRF8) represses PTPN13 gene transcription in differentiating myeloid cells. J. Biol. Chem. 283: 7921–7935.
. 2004. Interferon consensus sequence binding protein (ICSBP; IRF-8) antagonizes BCR/ABL and down-regulates bcl-2. Blood 103: 3480–3489.
. 2006. Identification of 12/15-lipoxygenase as a suppressor of myeloproliferative disease. J. Exp. Med. 203: 2529–2540.
. 2009. Loss of Irf8 does not co-operate with overexpression of BCL-2 in the induction of leukemias in vivo. Leuk. Lymphoma 50: 2078–2082.
. 2009. Nf1 haploinsufficiency and Icsbp deficiency synergize in the development of leukemias. Blood 113: 4690–4701.
. 2008. Constitutive activation of SHP2 in mice cooperates with ICSBP deficiency to accelerate progression to acute myeloid leukemia. J. Clin. Invest. 118: 853–867.
. 2010. IFN-γ upregulates survivin and Ifi202 expression to induce survival and proliferation of tumor-specific T cells. PLoS ONE 5: e14076.
. 2007. Targeting lymphotoxin beta receptor with tumor-specific T lymphocytes for tumor regression. Clin. Cancer Res. 13: 5202–5210.
. 2011. TNFα cooperates with IFN-γ to repress Bcl-xL expression to sensitize metastatic colon carcinoma cells to TRAIL-mediated apoptosis. PLoS ONE 6: e16241.
. 2011. IRF8 regulates acid ceramidase expression to mediate apoptosis and suppresses myelogeneous leukemia. Cancer Res. 71: 2882–2891.
. 2009. IFN regulatory factor 8 sensitizes soft tissue sarcoma cells to death receptor-initiated apoptosis via repression of FLICE-like protein expression. Cancer Res. 69: 1080–1088.
. 2008. 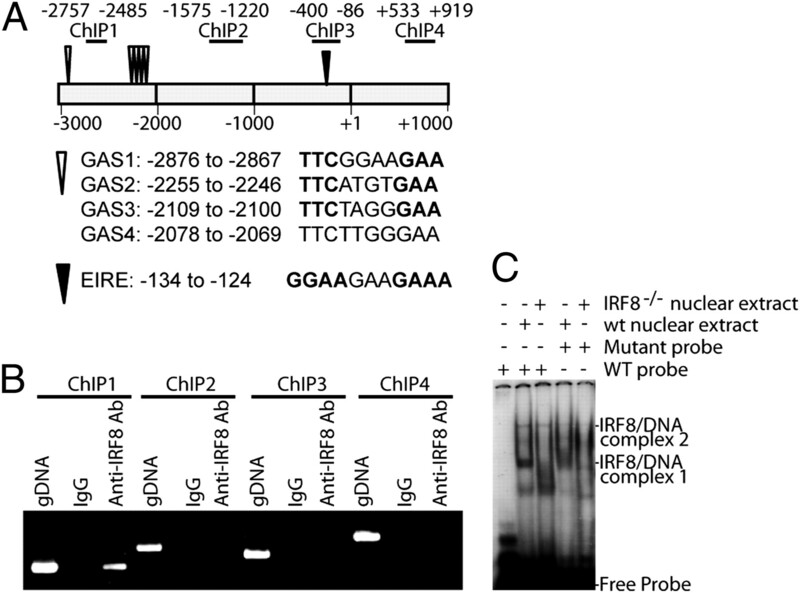 DNA methylation represses IFN-gamma-induced and signal transducer and activator of transcription 1-mediated IFN regulatory factor 8 activation in colon carcinoma cells. Mol. Cancer Res. 6: 1841–1851.
. 2000. ICSBP directs bipotential myeloid progenitor cells to differentiate into mature macrophages. Immunity 13: 155–165.
. 2005. Immune cell-specific amplification of interferon signaling by the IRF-4/8-PU.1 complex. J. Interferon Cytokine Res. 25: 770–779.
. 2011. IRF8 and IRF3 cooperatively regulate rapid interferon-β induction in human blood monocytes. Blood 117: 2847–2854.
. 2006. Interferon-gamma induces regression of epithelial cell carcinoma: critical roles of IRF-1 and ICSBP transcription factors. Oncogene 25: 3670–3679.
. 2007. Repression of IFN regulatory factor 8 by DNA methylation is a molecular determinant of apoptotic resistance and metastatic phenotype in metastatic tumor cells. Cancer Res. 67: 3301–3309.
. 2007. IFN regulatory factor 8 mediates apoptosis in nonhemopoietic tumor cells via regulation of Fas expression. J. Immunol. 179: 4775–4782.
. 2011. Myeloid-derived suppressor cells express the death receptor Fas and apoptose in response to T cell-expressed FasL. Blood 117: 5381–5390.
. 2000. The multifaceted role of Fas signaling in immune cell homeostasis and autoimmunity. Nat. Immunol. 1: 469–474.
. 2001. Proapoptotic BAX and BAK: a requisite gateway to mitochondrial dysfunction and death. Science 292: 727–730.